There’s never been a more glorious time to be a PC gamer. Once regarded as the red-headed stepchild of games, more and more titles have begun calling the PC home, thanks to the rise of Steam and the inclusion of AMD hardware in both next-generation consoles, which makes porting efforts easier. But the power inside the Xbox One and PlayStation 4 are roughly equivalent to a mid-range modern gaming rig—meaning they can’t hold a flame to the glorious visual excess today’s top graphics cards can pump out. The PC offers today’s best gaming experiences, period. This week we’re going to bask in that. Over the coming days, we’re going to showcase a trio of fire-breathing PC builds celebrating the best that Intel, Nvidia, and AMD have to offer. On Friday, we’ll showcase the PC games that melt eyeballs and push hardware to extremes. But today, we’ll kick things off by comparing the most powerful single-GPU graphics cards available today: Nvidia’s GTX 980 and 970 versus AMD’s Radeon R9 290X and R9 290. If you’re looking for nitty-gritty architectural details for these cards, you’ll have to look elsewhere; this article is dedicated to raw performance, pricing, and highlight features. You know, real-world worries. But fear not: PCWorld’s intro articles for the R9 290, R9 290X, and Nvidia’s recently launched 900-series cards can get you up to speed on ROPs and memory clockspeeds. Our GTX 970 is a special case. While AMD and Nvidia provided reference cards of the R9 290, R9 290X, and GTX 980, Nvidia didn’t create physical reference cards for the GTX 970. 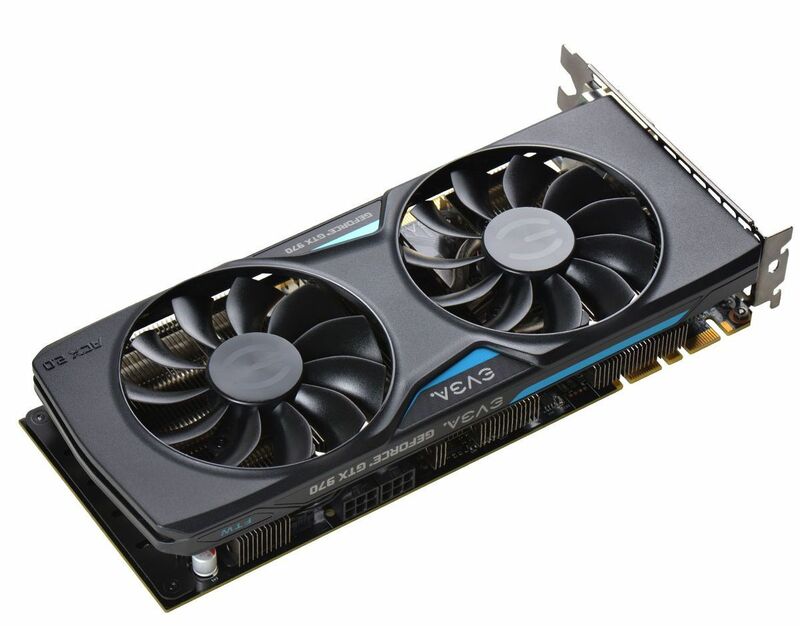 EVGA graciously provided PCWorld with an EVGA GeForce GTX 970 FTW with ACX 2.0 (whew!) for testing. The EVGA GeForce GTX 970 FTW with ACX 2.0. The EVGA GTX 970 FTW utilizes a large heat sink under a pair of large fans, and the ACX cooling set-up has been redesigned from previous versions to provide more cooling oomph with less fan noise and a reduced power draw. That lets you get more substantial overclocks, which in turn boosts performance. In fact, the EVGA GTX 970 FTW comes with a beastly overclock already put in place at the factory—1216MHz core clock and 1367MHz boost clock—and ships with EVGA’s vaunted PrecisionX overclocking software if you want to push it even further. The extra performance comes at a price, of course: The EVGA GTX 970 FTW costs $370, or $40 more than the MSRP for “stock” GTX 970 cards. 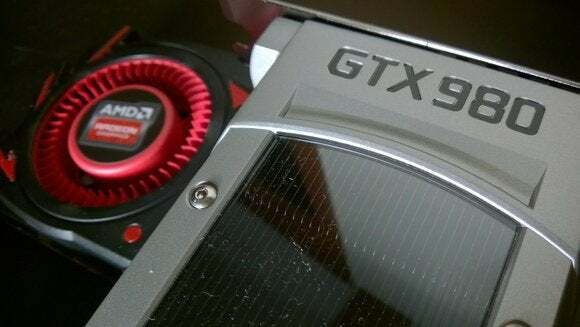 But every available GTX 970 card features some variance in cooling technology and clock speed, given the lack of an official Nvidia reference model. But enough spec talk! Let’s dig into frame rates. You’ll notice a trend as we work our way through these: Nvidia’s new cards—even the overclocked GTX 970—soundly beat AMD’s top-end hardware when it comes to pure frame rates. That’s not incredibly surprising, since Nvidia’s “Big Maxwell” GPU architecture was revealed mere weeks ago, while AMD’s R-series cards are going on a year old. 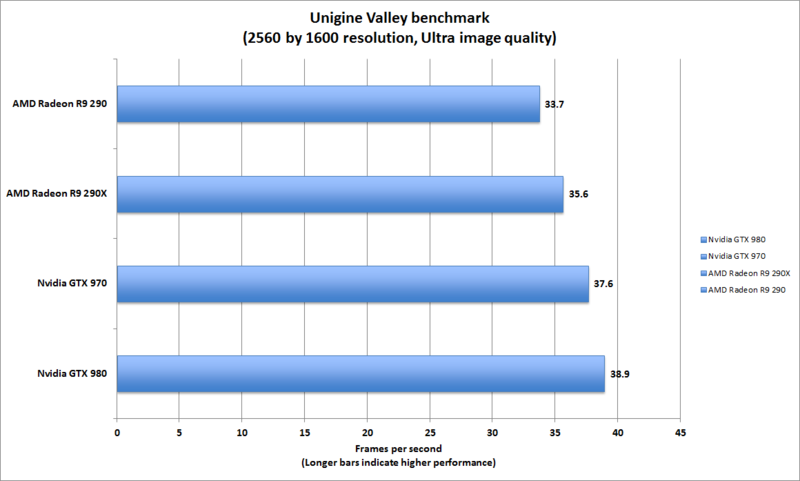 There’s more to this debate than pure graphics performance, however, which we’ll cover after the raw numbers. 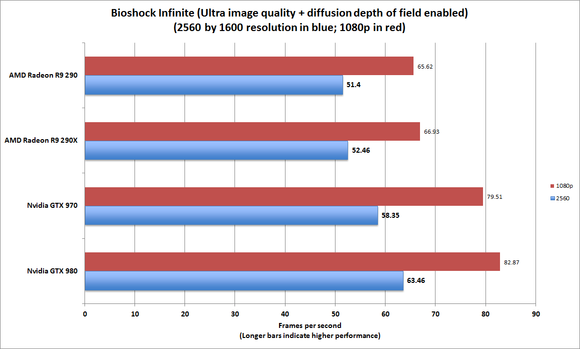 A quick note: All Radeon R9 290X figures are in “Uber” mode. 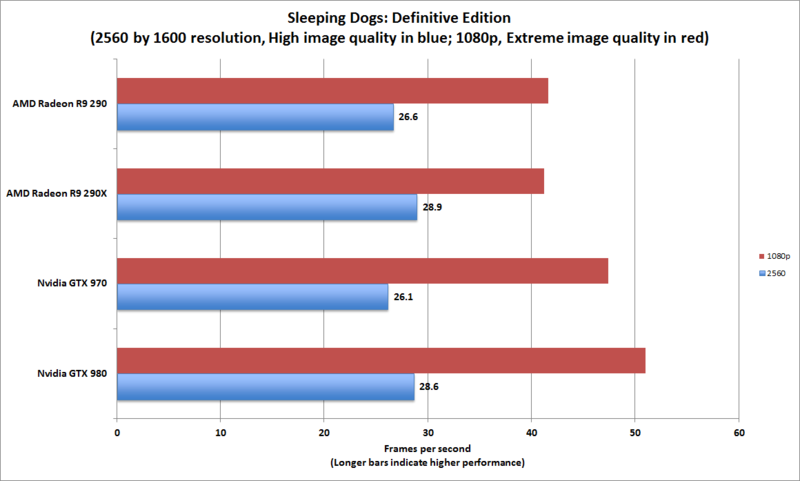 Transitioning the card to “Quiet” mode usually only resulted in about a 1 frame-per-second difference in our tests. We’ll start with our old standby, Bioshock Infinite, an Unreal Engine 3 title. Modern high-end cards easily handle Columbia’s floating cities, but it allows us to see how today’s graphics hardware treats games that aren’t utter benchmark hogs—and we can compare the results against PCWorld’s stable of systems benchmarked in the past couple of years. Click on any chart in this article to enlarge it. Next up we have Sleeping Dogs: Definitive Edition and Metro: Last Light Redux, two recent remakes of demanding games with built-in benchmark features. First up, Sleeping Dogs. 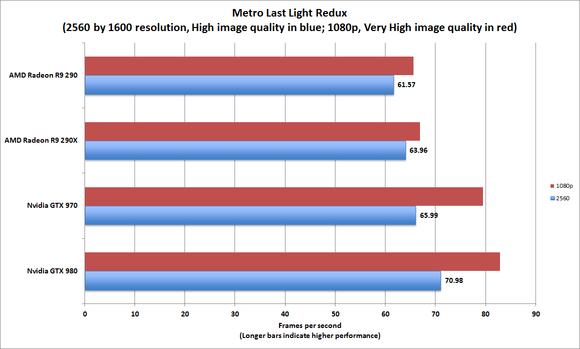 Note that we test Metro: Last Light with SSAA filtering disabled, since it looks gorgeous enough as-is and—more importantly—enabling it effectively drops frame rates in half. You very likely wouldn’t play Metro with SSAA active, and we won’t test it with SSAA active, either. We also disable Advanced PhysX. All graphics cards deliver respectable frame rates, but again, the GTX 900-series comes away with the overall win. Crytek’s Crysis series is known for its system-hammering beauty, and Ryse: Call of Rome packs an improved version of the Crytek engine to deliver even more beautiful visuals than Crysis 3. 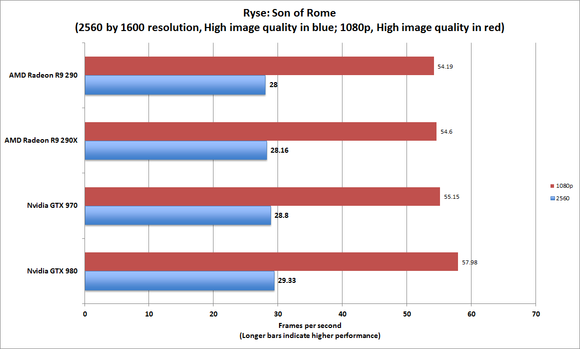 We benchmarked a consistently reproducible section of Ryse’s opening combat scene using the FRAPS tool. 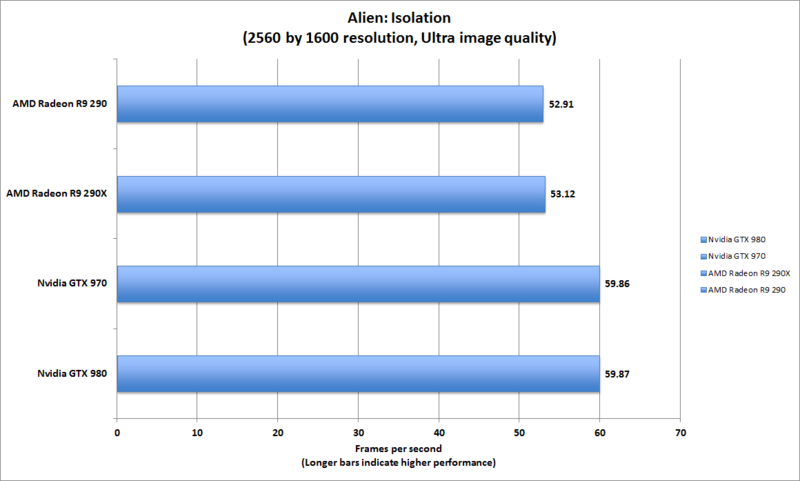 Alien: Isolation is a gorgeous new game with a built-in benchmarking tool. While it seems to be CPU-bound to some degree, we decided to toss it into the mix as well, as all the graphics card were tested using the same base PC. Nvidia’s clear victory here comes as a bit of a surprise, as Alien: Isolation was developed as part of AMD’s Gaming Evolved program. Finally, we also tested the cards using the Unigine Valley and 3DMark 11 Fire Strike benchmarking tools. Nvidia’s cards hold the clear performance crown over AMD’s, but they have another ace in the hole as well. The GTX 980 and 970 sport Nvidia’s “Big Maxwell” GPU architecture, which adapted tricks learned from the Nvidia CPU team to increase power efficiency while still pushing performance. 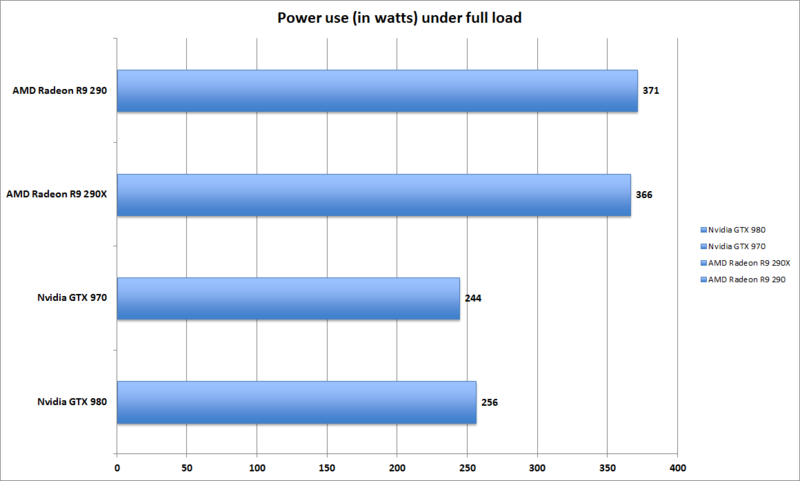 Indeed, our tests reveal that Nvidia’s cards consume drastically less power than AMD’s when under full load—more than 100 watts less. 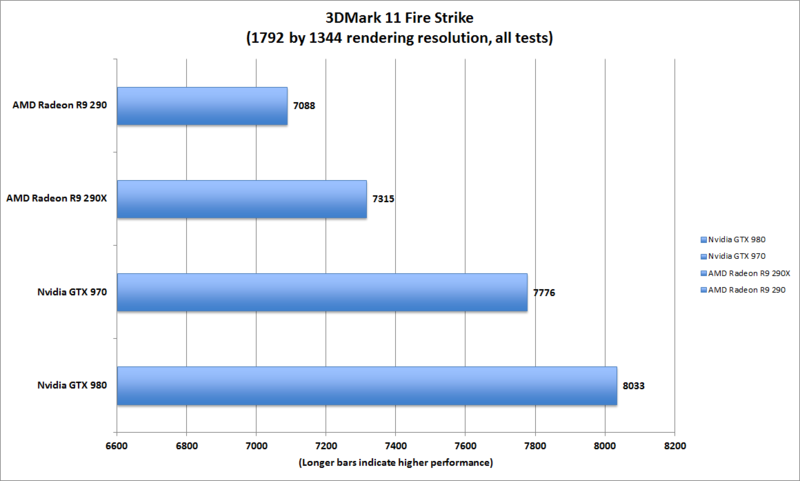 Not shown in the benchmarks is how much cooler and quieter Nvidia’s cards run compared to AMD’s. While the R9 290 and R9 290X are a vast sonic improvement over past-generation Radeon hardware—which sometimes sounded like a plane taking off—they’re still much louder than Nvidia’s supremely quiet GeForce duo under full load. Peeking at GPU temperatures revealed a big reason why: The GTX 980 and 970 can run all day long under full load and top out at 72 degrees Celsius, while the Radeons chug along at 92 degrees. That much extra heat requires more fan power to keep cool, though to AMD’s credit, its cards stayed stable even after long stress tests. Read on for pricing, extra features, AMD's framerate-boosting Mantle technolovy, and other considerations that may turn the tide of this battle, as well as the final verdict.